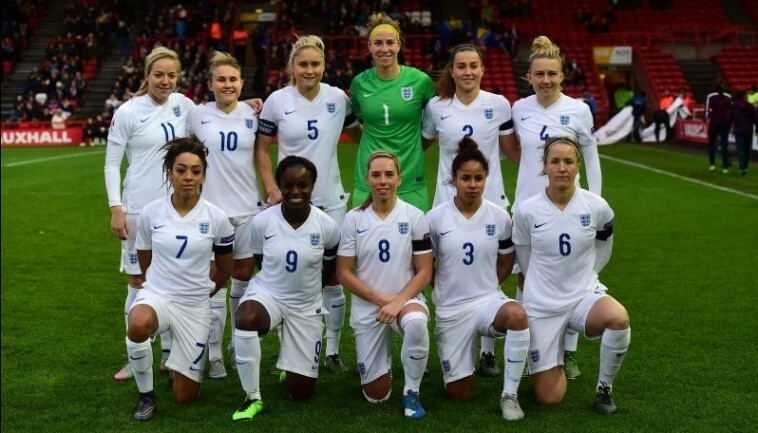 Mark Sampson has named a 23 player squad for the two Euro qualifiers in April. England’s opening game is against Belgium, their first home match of 2016, at the AESSEAL New York Stadium in Rotherham on Friday 8 April (7.55pm KO). They then travel to Zenica where they play Bosnia & Herzegovina at the NFSBiH Training Centre on Tuesday 12 April (3pm BST KO). The Lionesses, who have risen to a record fourth position in the latest FIFA World Rankings, have a 100 per cent record in their UEFA Women’s 2017 European Championship qualifying campaign. Pictured above the England Team pose for a group photo ahead of the UEFA Women’s Euro 2017 Qualifier between England Women and Bosnia Women at Ashton Gate on November 29, 2015 in Bristol, England.